The role of IJN destroyers. It's sad that a whole line of DDs have been reduced to hoping the other team potatoes. If you get torped in smoke, most of the time it is your own fault. I know whenever I've gotten torped in smoke, my first thought was been, "well, I was an idiot." It's not really that hard to avoid. I find on my Shima, if I'm playing equally skilled players I have to hide for the first third of the game and then try to get my damage scores towards the last half of the battle on the stragglers. "Hide" may be a bit of stretch, but you do need to play a lot more conservatively at the start. I do get it. I get most of my damage and xp later in the game. It does make me wonder though if I could help the team, and my win rate, if I could get the big blows in the first half. The Shima walks a fine line between doing nothing or being dead. If you aren't very good with IJN DD dont play them. There are plenty of simple and easy to use ship lines in the game: german BB, RN BB, RU DD. IJN DD require a lot of skill and experience, leave them to those that know how to use them correctly and for god sakes stop crying about the nerfs. Oh please. Those of us who DO have lots of experience in them know how broken they are. We're not whining, we're pointing out how badly stupidly nerfed WG has made them. 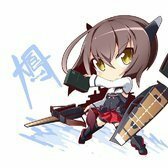 All the skill in the world doesn't compensate for the hideously uneven game play of the IJN DD experience, nor does it counter the way that the IJN DDs are fundamentally flawed. "Don't play it unless your unicum" is one of the dumbest retorts I've seen in a long time. Can people stop assuming I'm saying I'm bad at them? I'm actually quite good at them. All I want to know is whether or not pan Asian DDS will fill the ijn torpedo role better, and if so, what will the IJN's niche be? oh, come on now, you know how easy it is for Shima to get into a good position to start with, thanks to the speed advantage Shima has. The more difficult ships to play with are slower and have worse torpedoes that are detected further out, without any kind of damage bonus. Shiratsuyu is damn slow, and the torps are just not good either, although she can spam many awful torps. It's just plain and simple. Type93 torps are balanced against T10 maneuverability, but you get them in T8, which makes them kinda crap, because T8 ships are more agile. Where as Type90 and Type8 torps are... well, they are utterly crap. Eh? I find her torps to be very effective due to their 67kt speed. Yes, the 0.7km surface detect could be better, as in, 0.6km or 0.5km. But meh, it'll never be buffed. Not ineffective in anyway IMO. Shima's 20km torps need to be reduced in detect range down... .not this idiocy of 2km detect range. I do not mind if they lower the damage of each torp to 12k as long as they drop the detect range to 1.2km and increase the flood chance to 75%. There's a reason they aren't often brought to competitive and ranked. Because when played with equal skill, they're out performed by other destroyers. The whole, "Git Gud" argument hasn't worked for about 20 years. Those are clearly hand picked above average results. By all accounts, your own average in Kagero is 41k average damage, which is less than half of your hand selected results. Because I can do that too. Scoring 208k dmg doesn't mean Type90 torps are utterly crap. This is incorrect. The reason IJN DDs are not often brought into competitive and ranked is due to the very high skill wall required to play them in that setting. Each DD has its own skill vs effectiveness curve. For example, An average player playing a benson will do much better than a kagero. This is due the Benson being more forgiving when it comes to making mistakes. But as you start making less mistakes the Kagero catches up to the Benson. And for high end play a Benson and Kagero can fight on even ground. Take look at the season 7 ranked. Myself and Rhino_MKII each picked a DD and ranked out exclusively with our respective ship. I chose the Hatsuharu and he chose the Farragut. We ended up 2 and 6 overall for win rate on the season. 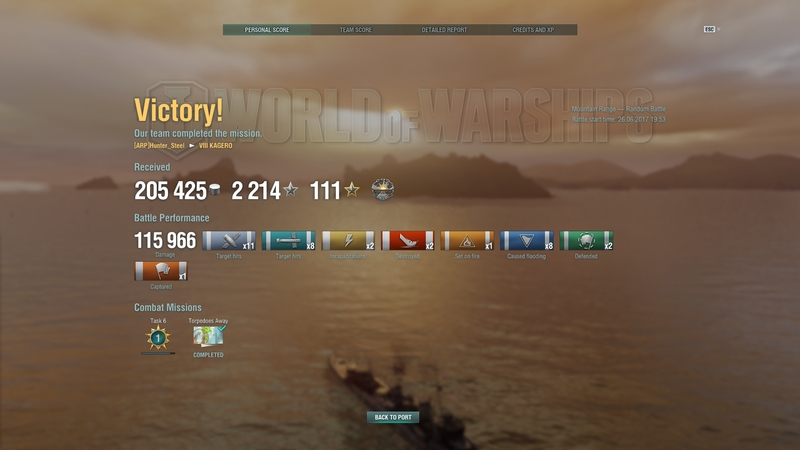 With the Hatsuharu having slightly better win rate. Now, I ask you how this would even be possible unless the Hatsuharu was equal or better than the Farragut? Looking at Supremacy league (Competitive WoWs), In a T8 format, the only T7 ship that is brought successfully is the Shiratsuyu. How would this be possible if the IJN DDs were inferior to the other lines? So the whole "Git Gud" argument does come into play. IJN DDs are the best or second best DD line, competing with the USN DDs. But, that only holds true for the very high end skill levels. At any other skill level the IJN DDs would probably be the worst DD line. As lacking map awareness or making mistakes are punished much more severely in IJN DDs. Did you read this part? " Because when played with equal skill, "
You can say any ship is better than another ship if one is played by a goober and the other by a skilled player. But if you put equally skilled players in the various DDs, there's no reason for the IJN DD to come out on top. Sighting one very specific scenario in which one very specific ship performs at one very specific tier does not make a line "best or second best." The IJN DD line is one that on average requires your opposition to be less skilled so that you can make use of torpedoes. The IJN DD line is also the easiest to hard counter with radar, hydro and carriers. It doesn't matter how much you "Git Gud" if the other players are just as good. You're often at a disadvantage due to the DD itself. And yes, Type 90 is painful to use. Type 93 mod 2 isn't much better. Compounded with the long reload, Kagero is just not fun to play, even though I do reasonably well in her. Other than Kamikaze for the tier, none of the Japanese torpedoes can be said to be effective. Yes, I did read when played with equal skill. Let me elaborate on the example I referenced. Myself and Rhino_MKII are as equal skilled in DDs as you could possibly find. (Rhino is slightly better) We had this EXACT argument on which DD was best in tier before the start of Ranked Season 6 & 7. Thus we each picked the DD we preferred and played the season during the same time frame. The result was the Hatsuharu having slightly better performance over the Farragut. For season 6 I was in the Shiratsuyu and Rhino was in the Sims. And the result was the sims having slightly better performance. This data set is probably the most accurate data you can find on how IJN dds perform vs USN dds in a high tier competitive setting. The result was that they have similar performance with the Tier determining which one would perform slightly better. And both are much better than any other DD line. The only exception to this would be at T10 where both the gearing and shimakaze are not as good compared to the other lines. So, you are incorrect. The IJN DDs and USN DDs are similar in max potential. The determining factor if someone is at a disadvantage while playing an IJN DD would be if they are an average or below player. Basically its not the ship, its how you play them. My average in Kagerou is 41k yes, however it is still 20k over the average damage. Hell, out of all my ships, she's one of my best ships in sheer WTR. And I am not unhappy with her WR either. Could my damage be higher? Yes, yes it could. However, I manage a fairly high hit-rate in my torpedoes, at 11%, which is 4% higher than the average. 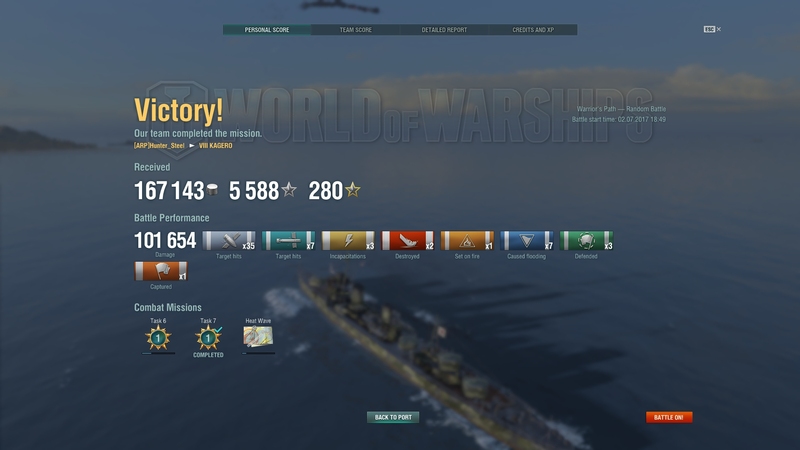 My average XP is down because I do not cap early, but rather, I prefer to cap later in the game when there are less DDs around. This is why I said that Kagerou's torps are not barely passable. But rather fairly effective when used in the right situation. Typos here, typos there, typos everywhere!! Surely, you must be mistaken, those are most certainly my stats. I wish for a day when I can make a joke and everyone understands me, I know they're yours, I have a lower hit rate, lower survival, higher WR, higher kills, and lower survival and kills/death. They just look very similar, and that was the point of my joke. Oh wow, some great irony right here. This pathetic excuse of an alibi means nothing to me you pathetic stat stealer! Hold up. If your damage is 20k above average, that makes the average kagero damage about 21k. How is that even possible? No wonder people say ijn DDS are bad, it looks like nobody can play them right. You are correct, good sir. The average damage for Kagerou is 21k. I have no idea, but yeah. My guess is people are too busy trying to contest caps early. 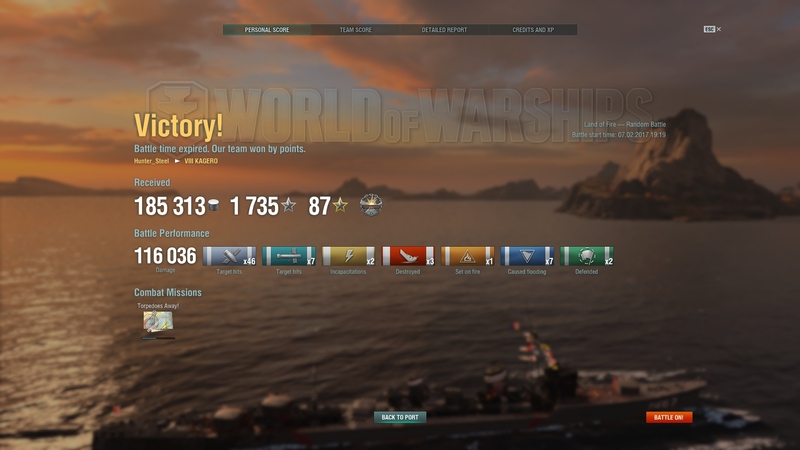 I play my Kag with the torp reload booster, so I don't have smoke, making me play far more careful than I should, hence my 60% survival rating. Server average damage for Kagero is 29.5k, according to WT. Darn, wrong again, but still that seems a bit low.